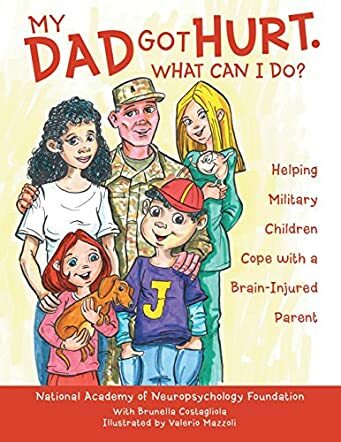 In an effort to help children of persons employed in the military cope with a brain injured parent, the National Academy of Neuropsychology Foundation, along with Brunella Costagliola, has compiled a book entitled My Dad Got Hurt. What Can I Do? The National Academy of Neuropsychology Foundation understands only too well the psychological damages that military personnel are susceptible to, the lasting effects they have on the individual, the changes in mood, personality and behaviour which the individual may experience, and how this situation impacts his/her family and wider society by extension. Focus is placed on the Smith family, which consists of Mr and Mrs Smith and their two children, Jackson and Isabella. Mr Smith suffered a brain injury while deployed and now the children must learn to live with their “new dad.” Fortunately for them, Doctor Johnson understands exactly what is happening to their dad and is more than happy to educate the family accordingly. Brunella Costagliola not only asks the question, "My Dad Got Hurt. What Can I Do?" She answered it well. In fact it was answered so perfectly and so simply that nine-year-old Jackson Smith and his younger sister, Isabella, who is only seven years old, could grasp the lesson taught by Doctor Johnson, and may apply same in order to effectively cope with their brain injured dad. The message was delivered expertly to resonate with the target audience. I work in the field of mental health; never have I seen this explained simpler.